We all pretty much know about thyme, it's one of those "basic" herbs we all have dried in our spice rack somewhere. We use it with basil and oregano in Italian recipes, we toss it in with bay leaves and celery and cayenne to give Cajun dishes flair, but this humble herb is really far more amazing than that. As well as being a really lovely addition to all kinds of cooking, thyme is one of the most powerful natural antiviral and antibacterial herbs around. It has been used medicinally for probably thousands of years, and is one of the four key ingredients in Thieves Vinegar--the story there is that, during the Black Plague, there were four brothers whose primary source of income was going into the homes of plague victims and robbing them blind. (Er...I guess if the plague victims were already deceased, blindness shouldn't be an issue, but you get what I'm saying.) But somehow they never got sick themselves. Eventually they were caught and sentenced to be hanged, but they were able to get their sentence suspended by sharing the ingredients in the amazing anti-plague vinegar their mother made for them, which they took every day. (No one has any idea if there is any documentable factual basis for this account, but it makes a good story.) Recipe here. There are also reports of doctors during plague times entering houses with paper cones over their face containing thyme and other herbs, through which they breathed, to keep from getting sick. Thymol, thyme's key consitutent, is a main ingredient in a number of commercial mouthwashes, including Listerine. Unfortunately, it is the thymol in Listerine which gives it that sort of icky taste. 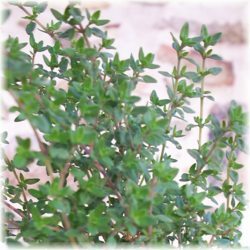 While thyme is gorgeous in cooking, most people, myself included, find it sort of gross-tasting when it pops up in other places. The essential oil, IMO, is one of the least pleasant smelling EO's I've ever encountered, but man it does it's job--if you feel like you're getting sick, put some thyme essential oil in a diffuser for a while and it'll clear the room--and the places in your lungs where the air goes--of most of the nasties you could pick up. Unfortunately it might also clear the room of people. (I tend to use eucalyptus and/or lavender for this purpose instead, but thyme is arguably considerably more powerful.) Thymol is also a key ingredient in the ever-popular Vicks Vapo Rub. As an aphrodisiac. Really? Well, maybe...the legend goes back to Egyptian times apparently, so it's not a new idea. I'd welcome any comments by folks who try this...we could "spice" things up a bit! Thyme essential oil diffused (or, I would guess, hot thyme tea inhaled) are also said to be helpful in treating headaches, including migraines. In this case I'd probably combine with peppermint, both to make the scent more pleasant and because mint is another good anti-headache herb. I could go on all day, but I won't--read the list at the Mountain Rose Herbs site of things thyme is used for, and check up on any that look intriguing to you! The list goes on and on; it seems to be sort of a "wonder-herb" for treating all kinds of things. It's an anti-everything, and a good tonic herb. Thyme is one of the easiest herbs in the world to grow, and there are lots of varieties. It winters well even in Chicago and comes back with even more verve the following year. I've planted it in places where nothing else takes hold, but the thyme manages just fine. The leaves are tiny and I personally find them a pain to get off the stalks, but often I'll just cut off a big sprig and put it in whatever I'm cooking, and then remove it before serving--this sends the flavor through the whole dish but makes my part of the job easier. So--gather ye thyme leaves while ye may! Good stuff. I love the smell of vicks vapor rub. I may have to give the thyme diffuser suggestion a try. With the Vicks, you mostly smell the menthol and eucalyptus...the thyme gets sort of subsumed into it. Thyme by itself is very different, more like plain Listerine. Who knew?!? Thyme grew in my old yard like a weed - even though I initially planted it. You're inspiring me to plant some in the new yard! I like to infuse thyme in olive oil and use it for cooking! Really nice with lemon in there too.